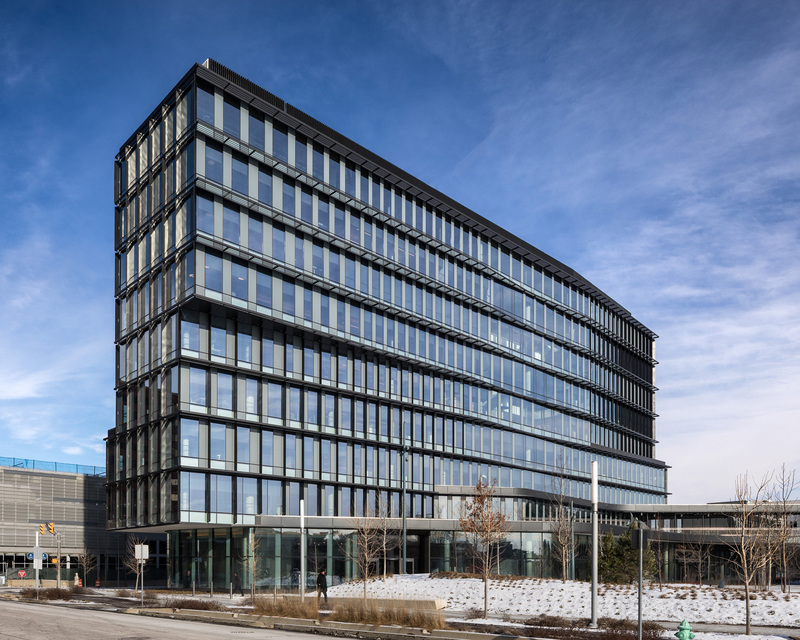 Deborah Berke Partners' first new construction office project, located in downtown Indianapolis, opened earlier this year. Designed for Cummins Inc., the nine-story building includes flexible office space, retail, and a new urban park, all of which support the engine company's business goals and the revitalization of downtown Indianapolis. The building sits on the site of a former arena that the architects say produced an anti-urban “gaping hole in the city.” The transformation of this site was driven by urbanistic motives designed to correct these failures, producing a carefully scaled mid-rise tower that is informed by contextual and environmental criteria. Products Curtain Wall and Storefront systems: Erie Architectural Products; Glazing: Viracon and Cristacurva (curved glass); Sunshade manufacturer: Clover Architectural Products; Garage façade manufacturer: Proclad, Inc. Examples of this design approach can be seen on the prominent south facade where its patterning undulates along the length of the building as opportunities for views outward into the city appear. A gradient pattern of frit glazing gives way to full view glass at the middle of the building facade to demarcate a series of double height “social hubs” centrally located in the building to foster a collaborative work environment. Elsewhere, on the west facade, afternoon shadows cast by a neighboring building allowed large projecting fins on the curtain wall to taper in depth as they track down the facade. 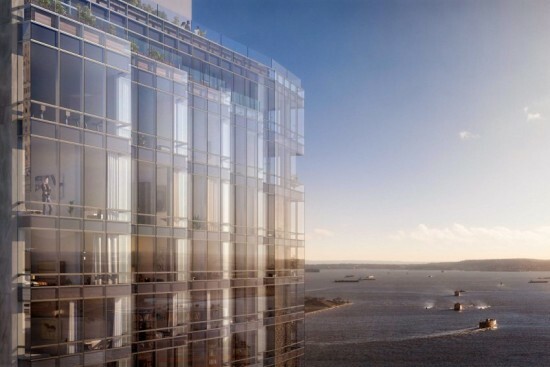 Noah Biklen, principal at Deborah Berke Partners, said that having a client who is a technology leader like Cummins inspired a careful “tuning” process in the design of the facade system, involving life-cycle analysis and a global look at project's design approach. “We wanted everything to have quality and precision, and [we] spent a lot of time thinking about the shaping of vertical fins, horizontal shades, and the detailing of connections. We introduced curvature to provide a very machined and engineered presence. Particularly at the corners, where we wanted to evoke a certain fluidity—a line that could be tracked around the building as the massing shifts.” Biklen added, “This feels like a Cummins engine to us.” One of the biggest challenges to the project was the schedule, which was fast-tracked at 28 months from the initial site visit to construction completion. The critical challenge of this schedule was ordering the glass, due to coordination and shipping times. To manage this challenge, a design assist process was introduced to help establish a collaborative project team early. Starting around the middle of the design development phase, a “basis of design” document that combined outline specs with some basic design drawings were used to bid out the project to facade contractors and fabricators. Biklen said, "you can immediately start talking about ordering the glass, tricky details, the corners of the building, and more. We were able to have these conversations four or five months into the design process, and we had a design partner who was ultimately going to be the one fabricating these details." 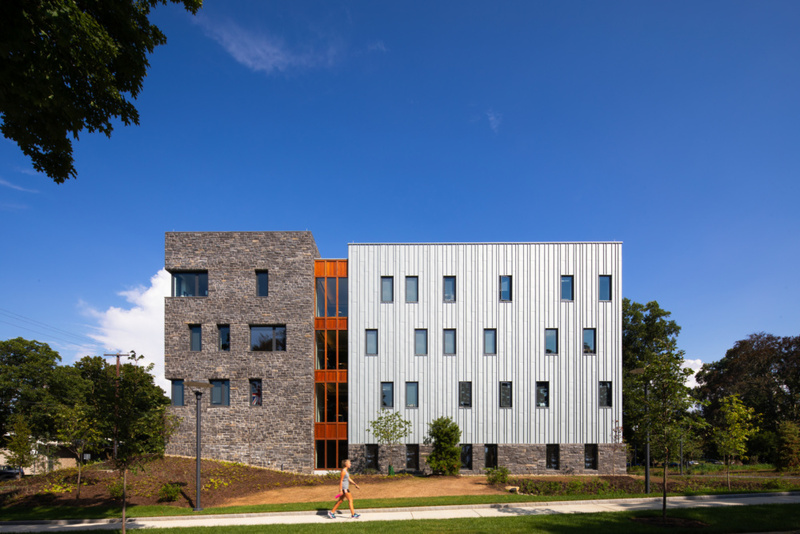 The unitized curtain wall facade features three modular widths and a subgrid of two-panel widths. This allows for some controlled variation to the compositional grid of the facade. The New-York–based architects said having a large site area to work with allowed plenty of room for various sizes of unitized panels to be delivered and stocked on site, which helped to ease the complexity of construction sequencing. 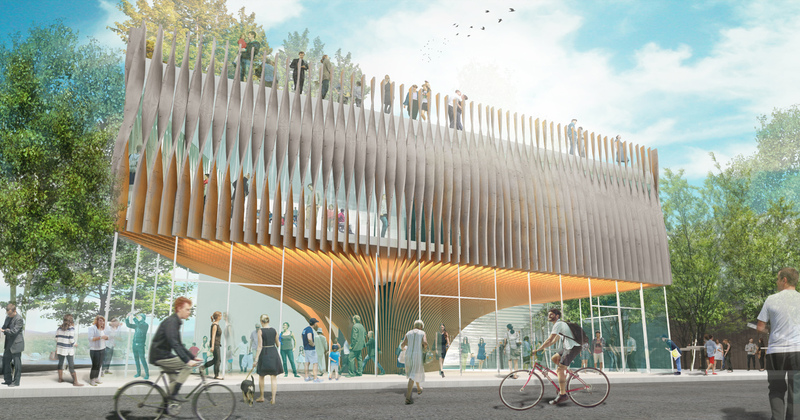 Another goal was to limit the amount of tempered glass in the project, which the architects said was not desirable due to known issues with spontaneous breakage, and visual “roller wave rippling” distortion from the manufacturing process. The alternative was to use heat-strengthened glass, which undergoes a manufacturing process that minimizes imperfections in the glass. 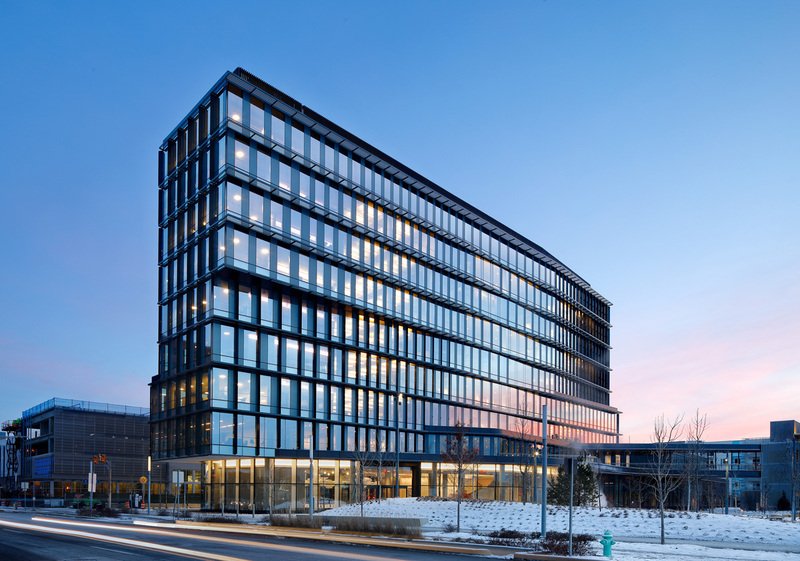 The end result was a product that maximized visual clarity and reflectivity of the building envelope, which Biklen said supported the urbanistic goals of the project. 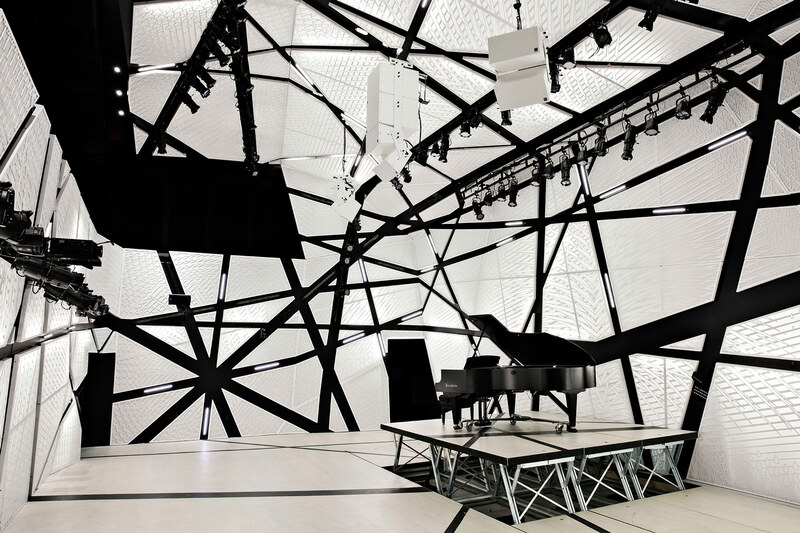 "You have a sense of the internal workings of the building from the city. The more you can be transparent at what's going on helps to make a strong connection to the city," Biklen said. 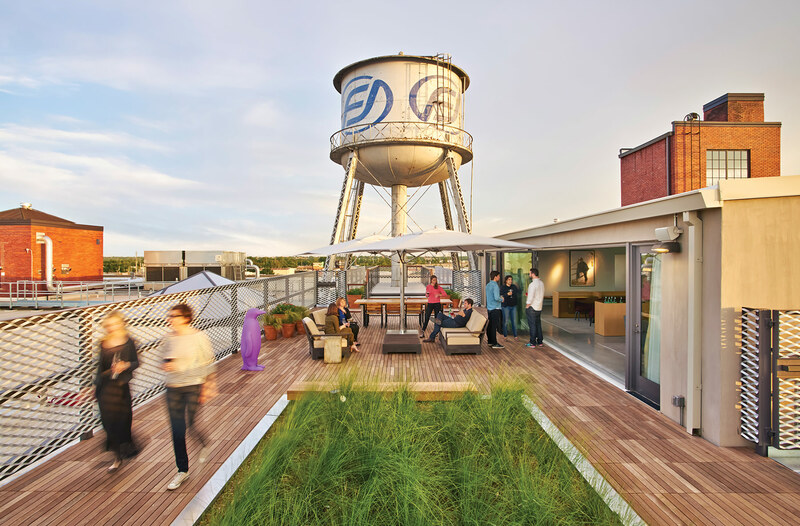 "Having the building be a little didactic makes it a good urban neighbor." Cummins Inc., the Columbus, Indiana–based diesel motor company has completed a new office tower in downtown Indianapolis. The nine-story building was designed by New York-based Deborah Berke Partners. The building will be home to distribution and select corporate offices. The slender profile of the new Cummins office, along with its orientation, are optimized to maximize environmental performance. Along with reducing heating and cooling loads, the shape allows for every worker to have direct access to natural light. The facade of the project is made up of a varied grid of glass and metal fins that are calibrated for the particular shading and daylight needs of each face of the building. J. Irwin Miller, Cummins’s former Chairman and CEO, had an intense interest in architecture and was a major architectural patron. The foundation which he founded helped fund many civic and cultural buildings by famous modernist architects in the small town of Columbus, Indiana. Cummins itself has facilities designed by architects such as Kevin Roche, Eero Saarinen, and Harry Weese. “Over the decades, Cummins has demonstrated a commitment to great design that benefits its employees, its customers, and the community,” said Deborah Berke in a press release. “This building carries that legacy forward with an environmentally sustainable design that dignifies the work going on inside while enhancing the urban realm. 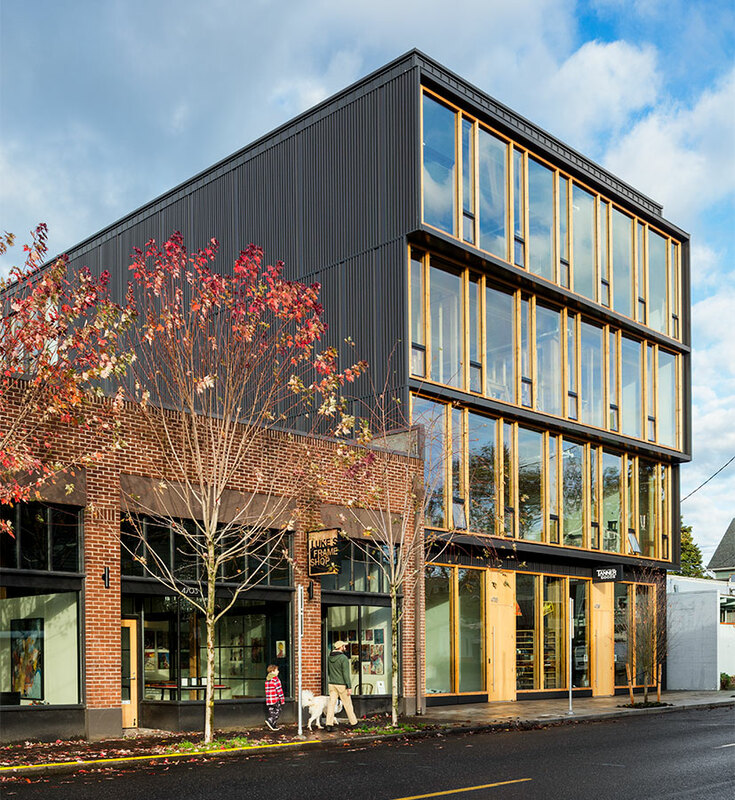 The building’s articulated facades and distinctive form serve a purpose—to create a comfortable, light-filled work environment for employees that adds to the vitality on Market Street. Adding some muscle to the great bones of downtown Indianapolis, the park is a public amenity that does double duty as a robust piece of green infrastructure.” The base of the tower includes a lobby and retail. Employee common spaces fills the second floor, including a space called the Square for large gatherings of employees and guests. The second floor also includes a conference center for employee development. Throughout the building flexible work spaces and connective common spaces allow for workers to collaborate and work in multiple configurations. Throughout the building, an art program will fill the workspaces with over 60 individual works of art. Three pieces by artists Kendall Buster, Odili Donald Odita, and the collaborative of Jennifer Riley and Emily Kennerk were commissioned specifically for the building. This article appears on HoverPin, a new app that lets you build personalized maps of geo-related online content based on your interests: architecture, food, culture, fitness, and more. Never miss The Architect’s Newspaper’s coverage of your area and discover new, exciting projects wherever you go! See our HoverPin layer here and download the app from the Apple Store. 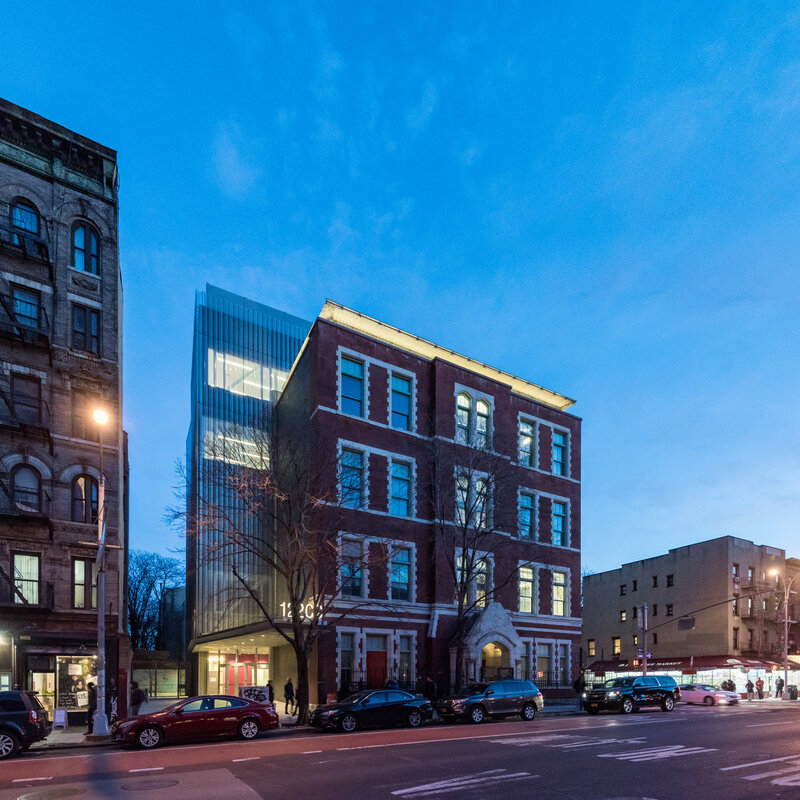 New York-based Deborah Berke Partners has been announced as winners of The Women’s Building International Design Competition by The NoVo Foundation and Goren Group. 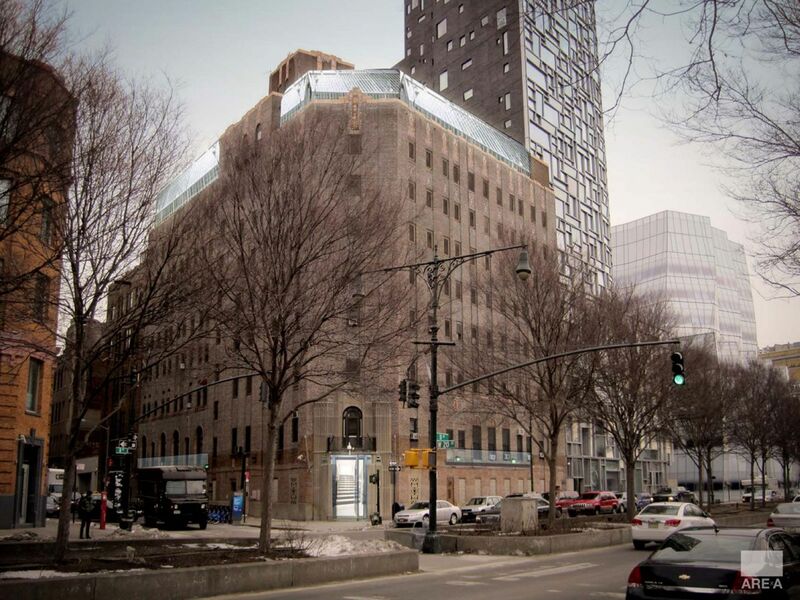 The competition saw 43 teams submit designs to repurpose the former Bayview Correctional Facility into The Women’s Building, which will be home for girl's and women's rights advocacy in New York. 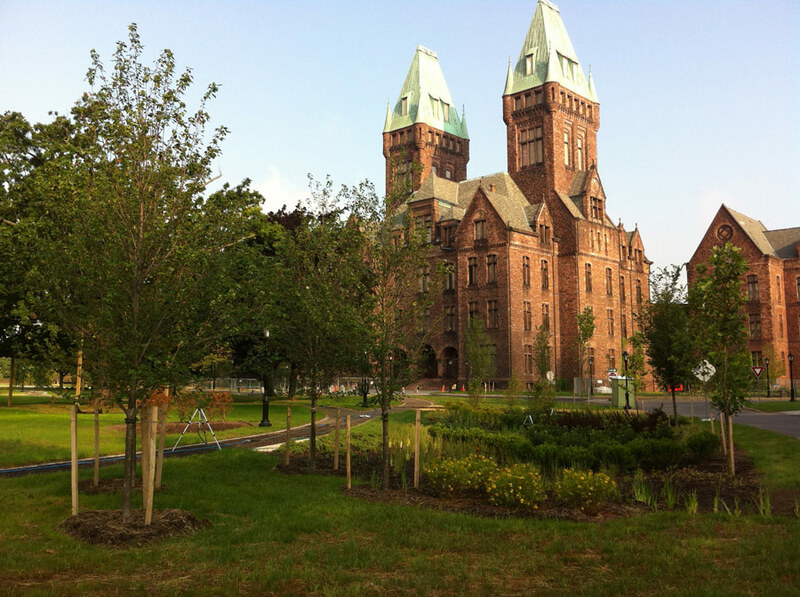 The 100,000 square-foot building is due to reopen by 2020, with ground breaking sometime next year. 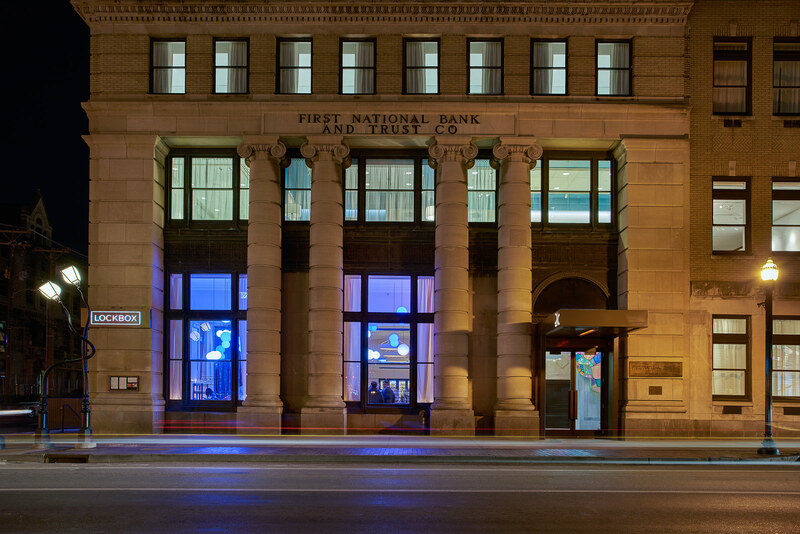 Lexington, Kentucky’s oldest skyscraper, the 1913 15-story McKim, Mead & White-designed Fayette National Bank Building, has been remodeled into the fifth iteration of the 21c Museum Hotels. 21c’s founders, two Louisville art collectors, spent $43 million converting the former bank into an 88-room boutique hotel. The Louisville-based chain is notable for including contemporary art spaces in its hotels. 21c Lexington includes 7,000 square feet of exhibition area with original art throughout the guest rooms and public spaces. New York–based Deborah Berke Partners were the design architects for the project, while Pittsburgh-based Perfido Weiskopf Wagstaff + Goettel acted as executive architects. The hotel’s restaurant, Lockbox—a nod to the building’s heritage—includes a 12-person private dining room in the original vault with a functional locking door. 21c’s exhibition space is free and open to the public, with tours offered on Wednesday and Friday evenings.